In this episode, I return to the old format! I play a song by the Gentle Readers; I discuss the differences between Flattr and Patreon and why I am thinking hard about going with the latter; I talk about my experience as a fan of Cats Laughing and their current Kickstarter; what the heck, let’s play some Cats Laughing too; I talk about my experiences with doing video interviews; I discuss the late 70s/early 80s Athens GA bands better than REM; I close out with a song from Glass Eye. So my brother and I did this over the holidays. I understand now what Garrick van Buren likes so much about the game. 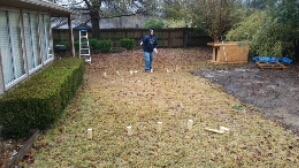 Also, my Kubb set received its baptism of rain and music. It is broken in now. In this episode, I do a wrap up of my experience of the Dog Days of Podcasting; I talk about other month long challenges I have attempted and failed at; I discuss why I still want to publish a paper zine; I reminisce about developing my own film and printing my own photos in high school; I talk about an exchange with Garrick van Buren that blew my mind. A couple months ago I put the Cullect widget on this blog’s sidebar. I’ve been trying to support Garrick van Buren and Cullect, mostly because he has always been a strong supporter of most or all of my projects and I owe him some karmic debt. There is one problem with that, though. When I first put on the widget, I was in three reading lists and now I’m in two. This is the sort of thing that I hope never matters to me but it subtly eats at me. Who dropped me? Why? Is it because I’m blogging less lately or because I’m blogging about more ephemeral topics with lack of time to tackle big ones? These are bogus questions hardly worth considering but they still pop into my head. I have no intention of dropping the widget but there is a psychic cost to having it that never occurred to me until today. I’ve been watching Garrick van Buren‘s Cullect project for a while now. I’ll admit that I feel a little guilty about it because I’ve taken several runs at it and I always feel like I’m not grokking the full power of it. I mean, it seems like it has a lot to offer and is interesting but I’m not sure how to fit it in my day to day cyberlife. This makes me feel guilty, since Garrick has been such a strong supporter of my show and of AmigoFish, my own side project. My failure to jump up and down immediately feels like a betrayal. I added the Cullect widget to my right sidebar so you can see a little of what it is all about and maybe follow the links back to the main site. I like the way when you look at an article that either references or is referenced by other articles in the system, it shows a map of them in a simple and better way than Technorati and other blogospheric management and mapping tools. I like the sharing and send mechanisms. Above and beyond that, I’m not sure what to do with it. Its paradigm is enough different that I don’t want to just use it like I would NetNewsWire or Google Reader. Also, Garrick was kind enough to name a release after me and a feature I inspired. I’m not sure what that feature is, but I think that is cool regardless. Thanks, Garrick. I thought that I would miss Twitter like an addict craving a fix. Instead it felt more like having a hypnotist cure a nervous tic overnight. Garrick van Buren forwarded me a link to this guy’s Twitter skepticism. What’s interesting that his issues and mine seem to be equal and opposite. He thinks people use @replies when they should use more direct messages. I prefer to have everything public unless there is a compelling reason to take it private. He doesn’t like the abandonment of the “What are you doing” conceit, and I think that is the most boring frigging thing ever. If he got his way, I’d abandon Twitter in a heartbeat. The service he describes holds even less value than Twitter currently holds for me. I’ve grown weary of the way Twitter leaves a kind of jangly feeling, like having three cups of coffee too many. There is always something coming in and more behind that. I see lots of people saying things like “I’m turning off Twitter for a while, I need to get things done.” Twitter is cute but it’s hard to get things done and pay attention to it. If you don’t pay attention to it constantly, you lose a lot of the power of it. It’s a conundrum and one I am having a hard time finding a reasonable balance with. And just because I don’t feel like writing a full post to encapsulate this link, I will admit that my Twitter contrarianism could be just as misguided as this Robin Hobb rant about blogging, in which she does her level best to sound like Harlan Ellison on the subject. I’m a little chagrined how much her piece has in common with mine, in that she thinks blogging kills writing and (at least for me) twittering seems to kill my blogging. The only part that resonates with me is the idea that one activity can subtract the urgency and energy to do the other. I’ve decided that I like the value blogging creates for me, which is different than the value of twittering. Each to his or her own. Garrick van Buren posts a musing on podcast advertising and references this here clambake in it. I sort of agree with his basic points and don’t know what to do about it. I could have an index of every firm that has ever sponsored the show. Would that be value add or just noise? Update: Dave Hamilton (aka my pimp) weighs in on the subject. He points out that Garrick remembered that such and ad existed and where 18 months after it ran is a wild success of the medium, not necessarily a failure. More on the overexposure front. I did an interview with Bazooka Joe at the Small World podcast all about the Uplifter movement and philosphy. I might do another one with him on AmigoFish as well, because I have not yet worn out my welcome completely. Obviously, that means I have work to do. I also did an interview with Garrick van Buren, this one mostly on AmigoFish, with an Uplifter chaser. Garrick is the host of the Minneapolis version of the Uplifter meeting, and it was cool talking both halves of this. I’ve also got a couple in the can that I did with other people – one a popular previous guest returning for another round, another a great interview with my new spiritual advisor. I cannot wait to get these out to y’all.